Western Birthday Party Ideas. How to plan a western birthday party. What could be more fun than a western theme birthday party? 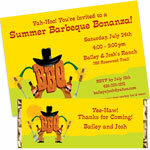 Fun western theme decorations like bandannas, hay and wanted posters, plus the cowboys grub of choice.... BBQ! It will be a hee-hawin', cattle ropin', square dancin' good time! An invitation sets the tone for the party before it ever starts – so round up your friends and family with one of our personalized western invitations. We really like the Western Hoedown Invitation too. 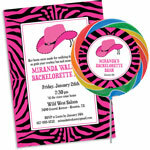 Add some boot scootin' confetti to whichever invitation to really excite your guests! 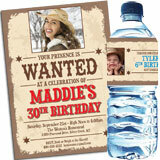 Create a WANTED poster as the invitation to your party! Roll it up with all of the party details on the inside, and tie it with a bandana. Use parchment colored paper and black lettering. Hand deliver a cowboy hat to your guests with all of the exciting party details folded up inside of the hat. Make sure to remind your guests, no cowboy hat, no entrance! Really make a ringing impression with customized cowbells, paint the name of each guest on the outside and attach the party details to the ringer inside. Send or hand-deliver. Cowbells can be found at your local novelty store or discount mass merchandiser. You are WANTED at Jim's 50th Birthday! Saddle Up for a 60th Birthday! Calling All Cowboys and Cowgirls... Mitch is turning 40! Yee Haw! Rita is turning 70! We are going to Round Up all of Sal's friends and family for a birthday hoedown! Welcome your guests with one of our personalized western banners so that everyone knows where the hoedown is! Don't worry we also have a matching Western Hoedown banner. You can also decorate the party entrance with a few bales of hay and a lasso or two for a real western welcome. First hang a few scene setters and then hang wanted posters throughout your venue. As your guests walk into the party room make sure they jump right into the western theme. At the entrance of the party have a life-sized cutout of the guest of honor as either a cowboy, cowgirl or even as a bull rider! You can place a basket full of bandanas, cowboy hats and western beads so your guests can enhance their attire if they desire. Yee haw! Encourage your guests to leave you a birthday message on a western sign in board for the guest of honor. Place it by the door on a table or easel near the cutout and the wearables. An inexpensive way to bring color and excitement to your party room is to use western balloons all around the space. Bouquets are perfect at the entrance, on tables, and for highlighting areas like the bar or dancefloor. These additions will definitely get your guests ready to celebrate the birthday. Have a country music playing. Or you can play the musical stylings of any of the great country stars out there like Patsy Cline, Johnny Cash, Loretta Lynn or Willie Nelson. 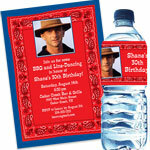 Use Western theme paper goods for fun theming and simple clean up. A western birthday party says western barbeque, so ribs, pork and beans, coleslaw and cornbread are all certainly great choices. But this is a birthday party so pizza, chili, easy to eat appetizers, desserts and birthday cake are all good choices as well – the food at your party can be as simple or elaborate as you want. No matter what you serve, be sure to have plenty of beverages; your guests will be thirsty after all the food and possible western showdown. Quench your guests' thirst with water and beer - all with personalized beer bottle labels and western water bottle labels of course! You can even let your guests drink out of a LED margarita glasses! Day or night, great entertainment is key to the success of any party. Your guests will be standing in line to have their pictures taken with a life size photo opportunity as a cowboy or cowgirl. Another great western party activity is square or line dancing. You can hire a professional "caller" to entertain you with authentic square dancing, or bring in a professional dance instructor to teach you how to do-si-do and 2 step. You can find more games on our Western Party Games page! Send your guests home with a sweet treat from your party. A scrumptious milk or dark chocolate candy bar with one of our personalized western birthday wrappers is a delicious souvenir for a wonderful party. As you already know we are big fans of the western hoedown candy bar wrapper. Have a great time at your western birthday party!